Rejected copper tubes & aluminium cans are generally the largest part of refuse. 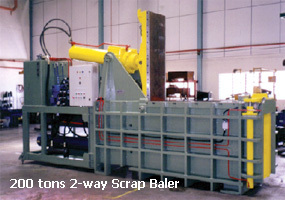 Their selection and pressing into bales will reduce significantly your waste volume and thus reduce your dispossal costs. Sale of recyclable bales will transform cost into profit. PHE bailing presses for multiple use are the answer to your refuse problem.